Fought on 31 May 1862 at Seven Pines, VA. Fought on 1 Jun 1862 at Cold Harbor, VA. Fought on 15 Jun 1862 at Seven Days Fight, Richmond, VA. Fought on 20 Jun 1862 at Seven Days Fight, Richmond, VA. Fought on 27 Jun 1862 at Richmond, VA. Fought on 27 Jun 1862 at Cold Harbor, VA. Fought on 29 Jun 1862 at Cold Harbor, VA. Fought on 1 Jul 1862 at Malvern Hill, VA. Fought on 9 Aug 1862 at Cedar Mountain, VA. Fought on 27 Aug 1862 at 2nd Manassas, VA. Fought on 1 Sep 1862 at 2nd Manassas, VA. Fought on 19 Sep 1862 at Sharpsburg, MD. Fought on 19 Sep 1862 at Hedgeville, WV. Fought on 1 Oct 1862 at Shepherdstown, WV. Fought on 15 Jan 1863. Fought on 15 Feb 1863. Fought on 3 May 1863 at Mayre's Heights, VA. Fought on 4 May 1863 at Marye's Heights, VA. Fought on 4 May 1863 at Fredericksburg, VA. Fought on 13 Jun 1863 at Winchester, VA. Fought on 14 Jun 1863 at Winchester, VA. Fought on 15 Jun 1863. Fought on 1 Jul 1863 at Shepherdstown, WV. Fought on 3 Jul 1863 at South Mountain, MD. Fought on 4 Jul 1863 at Smithburg, MD. Fought on 4 Jul 1863 at Falling Waters, MD. Fought on 5 Jul 1863 at South Mountain, MD. Fought on 5 Jul 1863 at Waterloo, PA. Fought on 5 Jul 1863 at Boonsboro, MD. Fought on 5 Jul 1863 at Chambersburg, PA. Fought on 6 Jul 1863. Fought on 23 Jul 1863 at Martinsburg, VA. Fought on 15 Sep 1863 at Richmond, VA. Fought on 25 Sep 1863 at Harrisonburg, VA. Fought on 1 Oct 1863 at 2nd Manassas, VA. Fought on 11 Nov 1863 at Rapidan Station, VA. Fought on 3 May 1864 at Mayre's Heights, VA. Fought on 5 May 1864 at Locust Grove, VA. Fought on 6 May 1864 at Mine Run, VA. Fought on 9 May 1864 at Lynchburg, VA. Fought on 10 May 1864 at Wilderness, VA. Fought on 12 May 1864 at Wilderness, VA. Fought on 12 May 1864 at Mine Run, VA. Fought on 19 May 1864 at Spotsylvania Court House, VA. Fought on 20 May 1864 at Spotsylvania Court House, VA. Fought on 21 May 1864 at Milford Station, VA. Fought on 21 May 1864 at Guinea Station, VA. Fought on 22 May 1864 at Jericho Ford, VA. Fought on 23 May 1864 at Spotsylvania Court House, VA. Fought on 23 May 1864 at Jericho Ford, VA. Fought on 24 May 1864 at Jericho Ford, VA. Fought on 1 Jun 1864 at Bowling Green, KY. Fought on 17 Jun 1864 at Lynchburg, VA. Fought on 20 Jun 1864 at Lynchburg, VA. Fought on 8 Jul 1864 at Harper's Ferry, WV. Fought on 9 Jul 1864 at Rossville, GA. Fought on 10 Jul 1864 at Monocacy, MD. Fought on 10 Jul 1864 at Harper's Ferry, WV. Fought on 10 Jul 1864 at Frederick, MD. Fought on 15 Jul 1864. Fought on 16 Jul 1864 at Loudon County, VA. Fought on 17 Jul 1864 at Newtown, VA. Fought on 23 Jul 1864 at Kernstown, VA. Fought on 24 Jul 1864 at Winchester, VA. Fought on 26 Jul 1864 at Lithonia, GA. Fought on 27 Jul 1864 at Flat Rock, GA. Fought on 10 Aug 1864 at Berryville, VA. Fought on 11 Aug 1864 at Winchester, VA. Fought on 11 Aug 1864 at Newtown, VA. Fought on 12 Aug 1864 at Winchester, VA. Fought on 12 Aug 1864 at Middletown, VA. Fought on 15 Aug 1864 at Deep Bottom Run, VA. Fought on 18 Aug 1864 at Deep Bottom Run, VA. Fought on 19 Aug 1864 at Weldon Railroad, VA. Fought on 19 Aug 1864 at Strasburg, VA. Fought on 28 Aug 1864 at Winchester, VA. Fought on 28 Aug 1864 at Atlanta, GA. Fought on 31 Aug 1864. Fought on 4 Sep 1864 at Atlanta, GA. Fought on 12 Sep 1864 at Cherokee County, GA. Fought on 17 Sep 1864 at Winchester, VA. Fought on 19 Sep 1864 at Canton, GA. Fought on 21 Sep 1864 at Fisher's Hill, VA. Fought on 25 Sep 1864 at Fisher's Hill, VA. Fought on 27 Sep 1864 at Port Republic, VA. Fought on 1 Oct 1864 at Harrisonburg, VA. Fought on 26 Oct 1864 at Gwinnett County, GA. Fought on 26 Oct 1864 at Frederick, MD. Fought on 6 Nov 1864. Fought on 7 Nov 1864. Fought on 12 Nov 1864. Fought on 23 Dec 1864 at Jack's Shop, VA. Fought on 5 Feb 1865 at Hatcher's Run, VA. Fought on 6 Feb 1865 at Hatcher's Run, VA. Fought on 27 Mar 1865 at Petersburg, VA. Fought on 3 Apr 1865 at Petersburg, VA Hospital. Fought on 3 Apr 1865 at Swift Creek, VA. Fought on 3 Apr 1865 at Chester Station, VA. Fought on 3 Apr 1865 at Jackson Hospl, Richmond, VA. Fought on 5 Apr 1865 at High Bridge, VA. Fought on 6 Apr 1865 at Sailor's Creek, VA. Fought on 6 Apr 1865 at High Bridge, VA. Fought on 7 Apr 1865 at High Bridge, VA. Fought on 8 Apr 1865 at Farmville, VA. Fought on 3 May 1865 at Anderson, SC. Fought on 19 May 1865 at Hartwell, GA. Fought on 20 May 1865 at Hartwell, GA. Fought on 23 May 1865 at Greenville, SC. Fought on 23 May 1865 at Andersonville, SC. Fought on 24 May 1865 at Greenville, SC. Nathan Bennett was promoted to Full 4th Sergeant in 1862.8 By early June of 1862, the 38th Regiment of Georgia was transferred to Lawton's Brigade which would become part of General Thomas Jonathan "Stonewall" Jackson's Division. He was admitted to Lovington Hospital in Winchester, Virginia for Parotitis on August 8, 1862 and returned to active duty on August 24, 1862. A few days before 17 Sep 1862, Sgt. Nathan Bennett Bagwell of the 38th Regiment Georgia Infantry was marching into the North, into Maryland. He was in a unit with no food [they ate green corn and apples] and no shoes. Detouring, under Stonewall Jackson's command, they marched all night to capture food and shoes at Harpers' Ferry, then with food and in new shoes marched all night a second night to make it to Antietam [as the Yankees called it, after the nearest creek], or Sharpsburg [as the Confederates called it, after the nearest town]. After marching all night under Stonewall ["the foot cavalry", they called themselves] the second night in a row, they arrived at dawn [17 Sep 1862] at the battle site of the bloodiest single-day battle of all times for America [23,000 died, missing or wounded]. Grampaw Bennett was in the bloodiest part of the bloodiest battle, "The Cornfield" and Grampaw Bennett was maybe in the bloodiest unit of the bloodiest part of the bloodiest battle; Grampaw Bennett's unit suffered 81% casualties that day. They left him on the field with a bullet in his leg. His life was saved by a Union [Yankee] doctor on September 20th, 1862 who amputated his leg about 3 or 4 inches below his knee on the battle field. He was subsequently treated at No. 5 U.S. Army Hospital in Frederick, Maryland before being paroled and furloughed home as disabled. On January 24, 1865 he was admitted to Confederate General Hospital No. 9 in Richmond, where he applied for an artificial limb, which was paid for by the Association for the Relief of Maimed Soldiers. [S218] United States Federal Census, Washington, District of Columbia, Population Schedule: Alpharetta, Milton, Georgia, Emuneration District: 157, Supervisor District: 1, Sheet: 12, Dwelling: 105, Family Number: 105, Date: 1880. [S17] Service Records, Service Records for Nathan Bennett Bagwell, Order for Photocopies Concerning Veteran, Receipt number 56546, Dated 8/7/69. [S180] Nathan Bennett Bagwell Tombstone (Photograph), Wayne Parker Bagwell, Pinson, Jefferson County, Alabama. [S213] "American Civil War Soldiers: Nathan Bagwell." 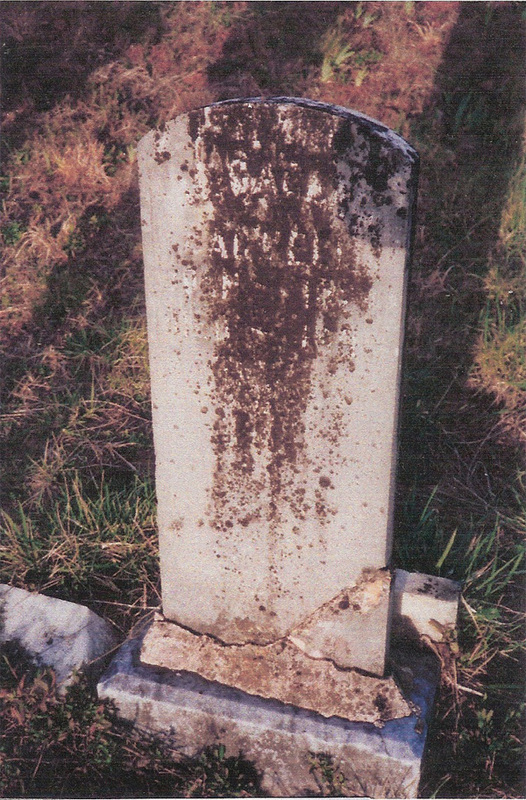 [S183] Sarah E. Bagwell Tombstone (Photograph), Wayne Parker Bagwell, Pinson, Jefferson County, Alabama. 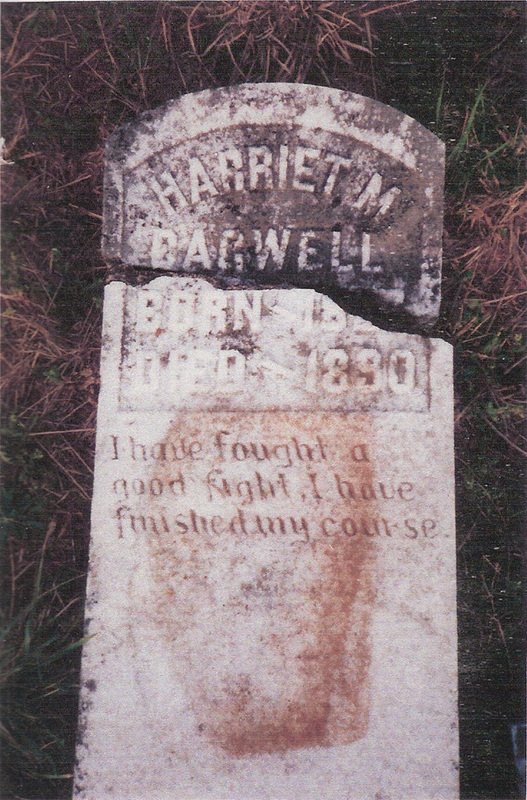 [S184] Sarah F. Bagwell Tombstone (Photograph), Wayne Parker Bagwell, Pinson, Jefferson County, Alabama. [S214] "American Civil War Soldiers: John Bagwell." William G. Bagwell - Pvt. 10/6/1861. Killed at Winchester, Va. June 13, 1863. 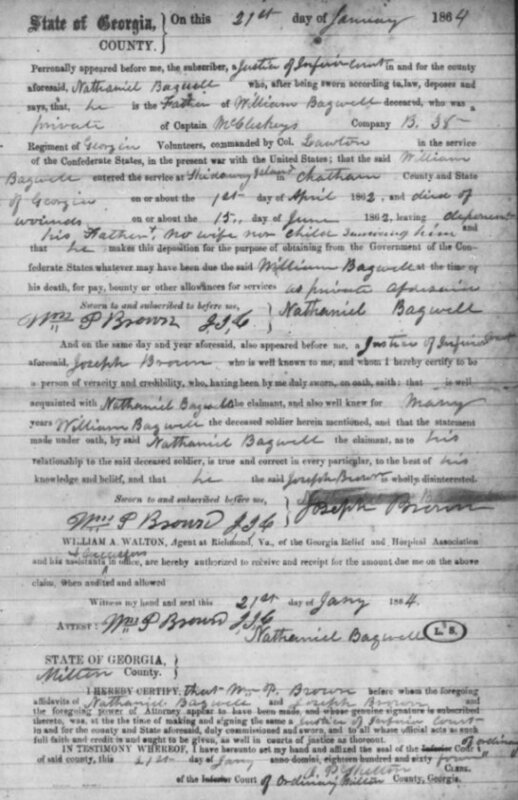 Son of Nathaniel Bagwell, father filed a claim for any monies owed his son in Jan., 1864. Born in N.C. about 1846. [S212] "American Civil War Soldiers: William Bagwell." Henry Bryant Bagwell was also known as Henry Bryant Bagwill. 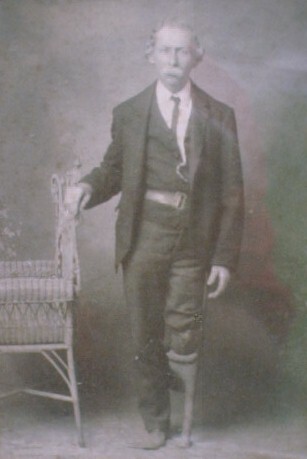 He was born in March 1852 in North Carolina.1,2 He was the son of Nathaniel Bunt Bagwell and Pherebee (Phereby) Unknown.3,1 Henry Bryant Bagwell married Rosetta Newkirk circa 1876. Henry Bryant Bagwell lived in 1876 in Nevada, California. 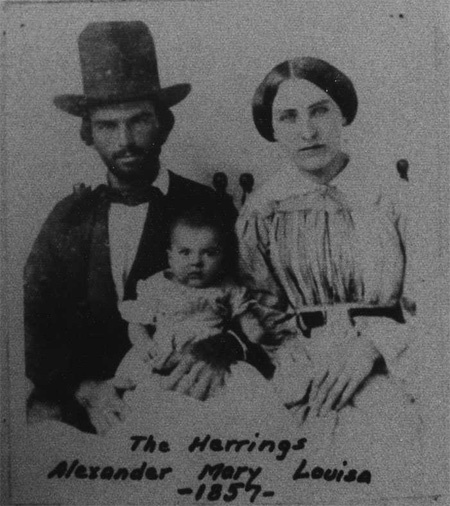 He and Rosetta Newkirk lived in 1890 in Sacremento, California. Henry Bryant Bagwell and Rosetta Newkirk lived in 1900 in Sutter, Sacramento County, California. Nancy Bagwell was born circa 1849 in North Carolina.1,2 She was the daughter of Nathaniel Bunt Bagwell and Pherebee (Phereby) Unknown.3,1 Her married name was Chapman. Nancy Bagwell married Henry Chapman. 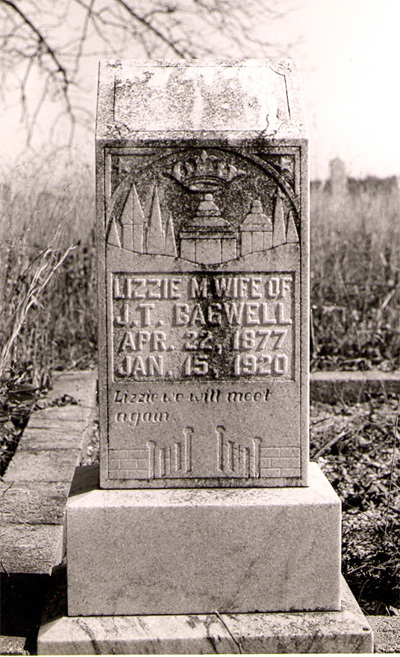 [S179] Lizzie Magnolia Bagwell Tombstone (Photograph), Wayne Parker Bagwell, Pinson, Jefferson County, Alabama, Establishes birth and death date. [S322] United States Federal Census, Washington, District of Columbia, Population Schedule: Bells, Forsyth, Georgia, Emuneration District: 51, Supervisor District: 39, Sheet: 12B, Dwelling: 213, Family Number: 216, Date: 1900. [S13] Letter, Nathan W. Bagwell to David A. Bagwell, 1994. [S206] John Tilmon Bagwell II, Death Certificate: John Tilmon Bagwell II. Holland Harris Bagwell was born on 5 August 1865. He was the son of Nathan Bennett Bagwell and Sarah Elizabeth Cogburn.1 Holland Harris Bagwell married Cora Douglas. Holland Harris and Cora Douglas had no children. Holland Harris Bagwell died in 1928.2 He was buried at Rest Haven, Alpharetta, Fulton County, Georgia. [S371] Huford Bagwell, Number: 253-46-6778, SSDI: Huford Bagwell, unknown series. [S248] United States Federal Census, Washington, District of Columbia, Population Schedule: 31st District, Forsyth County, Georgia, Sheet: 418, Dwelling: 903, Family Number: 903, Date: 1850. Harriet M. Stone was born on 18 June 1827 in Edgefield, Edgefield County, South Carolina.2,3,4 She was the daughter of Micajah Stone. Harriet M. Stone married Micajor Bagwell, son of Jesse Bagwell and Mary "Polly" Raybourn, in 1837.2,1,5,3 As of 1837,her married name was Bagwell.2 Harriet M. Stone and Micajor Bagwell lived in 1860 in Forsyth County, Georgia.2 Harriet M. Stone died in December 1890 in Alpharetta, Forsyth County, Georgia, at age 63.4 She was buried at Union Hill, Alpharetta, Forsyth County, Georgia; Tombstone enscription says "I have fought a good fight. I have finished my course"
On 1 February 1861, James Emory enlisted as a private in Company D, 4th Infantry Regiment South Carolina, known as the "Piercetown Guards". Family legend has it that he walked from Georgia back to South Carolina to enlist. He also was wounded (shot) in the arm. This regiment was organized at Anderson in March of 1861. It fought first at First Manassas under N. G. Evans where it had 11 killed, 79 wounded, and 6 missing. In April of 1862, the regiment had 450 men. If was consolidated into five companies and redesignated as the SC 4th Infantry Battalion. Company B became company D of the Palmetto Sharpshooters. After Antietam, it was reorganized into Hamptons Legion and returned to action in the fall of 1863 in Longstreet's Corps during the Battle of Chickamauga and the subsequent Chattanooga campaign. The Legion infantry later returned to Virginia and rejoined Robert E. Lee's army. In March 1864, it was converted to mounted infantry and reassigned to Fitzhugh Lee's cavalry brigade. It harassed Federal supply depots throughout northern Virginia, and fought in several actions during the lengthy Siege of Petersburg. What was left of the Hampton Legion infantry surrendered with General Robert E. Lee at Appomattox Court House in early April 1865. [S324] United States Federal Census, Washington, District of Columbia, Population Schedule: Big Creek, Forsyth, Georgia, Page: 25, Dwelling: 211, Family Number: 183, Date: 1870. [S323] United States Federal Census, Washington, District of Columbia, Population Schedule: Bells, Forsyth, Georgia, Enumeration District: 75; Supervisor District: 1; Page: 2, Dwelling: 22, Family Number: 22, Date: 1880. [S325] United States Federal Census, Washington, District of Columbia, Population Schedule: District 31, Forsyth, Georgia, Page: 375, Dwelling: 596, Family Number: 596, Date: 1850. John Tilmon Bagwell was born on 27 April 1873 in Forsyth County, Georgia.3,4,1,2,5 He was the son of James Emory Bagwell and Louisa Elizabeth R. Brown.3,1 John Tilmon Bagwell married Lizzie Magnolia Bagwell, daughter of Nathan Bennett Bagwell and Sarah Elizabeth Cogburn, on 9 August 1894.3,6,2,4 John Tilmon Bagwell was a farmer in 1900 at Forsyth County, Georgia.4 He lived in 1920 in Alpharetta, Milton County, Georgia.2 He married Mary Lena Mosteller, daughter of William Wilbur Mosteller and Martha L. Rucker, on 21 November 1920 at Milton County, Georgia. John Tilmon Bagwell and Mary Lena Mosteller was separated on circa 1922 at Alpharetta, Milton County, Georgia.7 John Tilmon Bagwell died on 6 April 1923 in Alpharetta, Milton County, Georgia.5, at age 49 A little feisty dog ran out of the woods and bit John Tilmon and he got rabies; as I recall they called it "hydrophobia", the old name. They locked him in a room to protect them from him. Side Note: Hydrophobia ("fear of water") is the historic name for rabies.It refers to a set of symptoms in the later stages of an infection in which the person has difficulty swallowing, shows panic when presented with liquids to drink, and cannot quench their thirst. Any mammal infected with the virus may demonstrate hydrophobia. Saliva production is greatly increased, and attempts to drink, or even the intention or suggestion of drinking, may cause excruciatingly painful spasms of the muscles in the throat andlarynx. This can be attributed to the fact that the virus multiplies and assimilates in the salivary glandsof the infected person or animal for the purpose of further transmission through biting. The ability to transmit the virus would decrease significantly if the infected individual could swallow saliva and water. 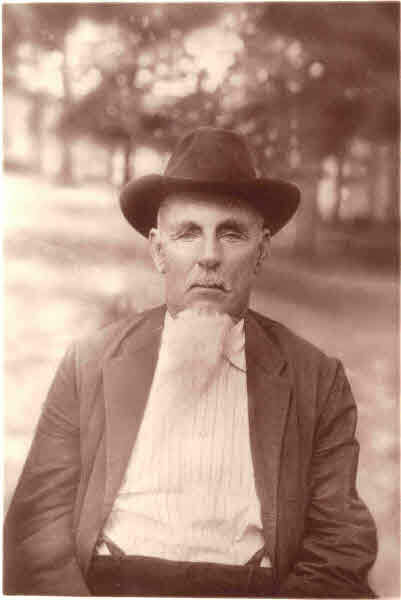 Grandberry Ross Bagwell was also known as Greenberry Ross Bagwell.1 He was born in 1829 in Wake County, North Carolina.2 He was the son of William Bryant Bagwell and Aisley Bunch. Grandberry Ross Bagwell married Burline Baucom on 3 January 1855 at Wake County, North Carolina. Grandberry Ross Bagwell married Nancy A. Hopson on 15 April 1858.1 Grandberry Ross Bagwell died on 5 March 1904 in Garner, Wake County, North Carolina. He was buried at Hayes Chapel Christian Church Cemetery, Garner, Wake County, North Carolina. 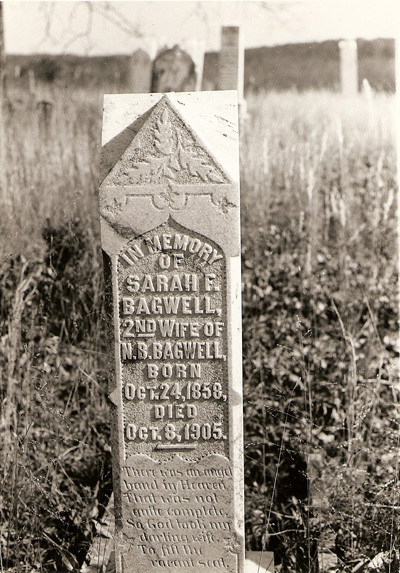 Sarah Ann Bagwell was born in 1832 in Wake County, North Carolina.1 She was the daughter of William Bryant Bagwell and Aisley Bunch. Sarah Ann Bagwell married Cullen Bailey on 19 June 1855 at Wake County, North Carolina.1 As of 19 June 1855,her married name was Bailey. 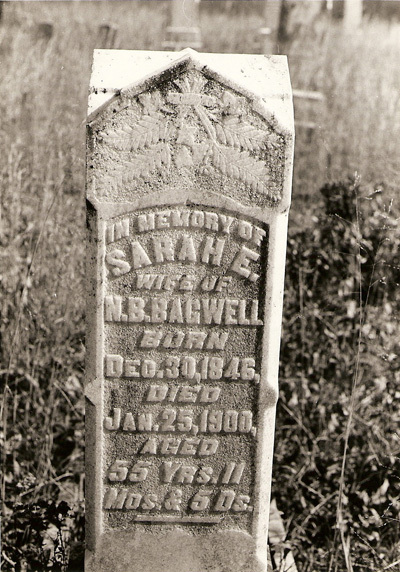 Sarah Ann Bagwell died on 2 November 1911 in Wake County, North Carolina.